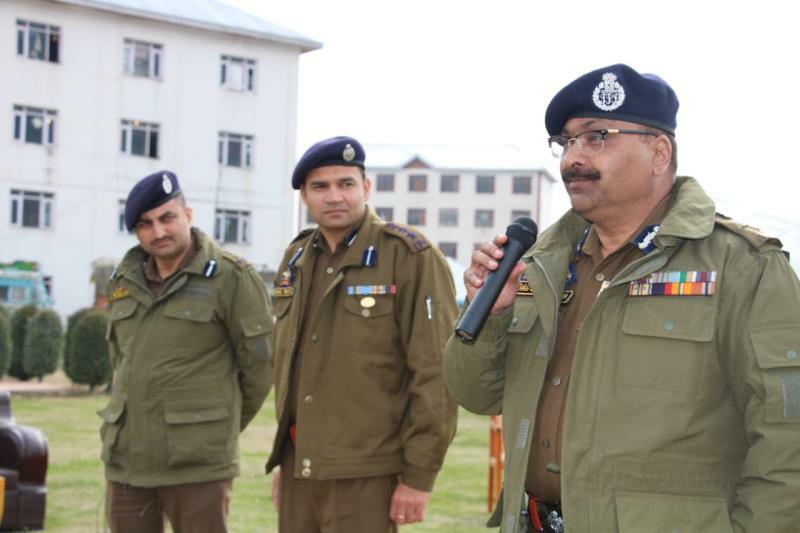 JAMMU, MARCH 18: To assess the police preparedness for the upcoming Lok Sabha elections, Director General of Police Shri Dilbag Singh today visited District Bandipora and had an interaction with the personnel of Police and CAPFs. He was accompanied by IGP Kashmir Shri S.P Pani and DIG North Kashmir Range Shri M.Suleman Choudhary. 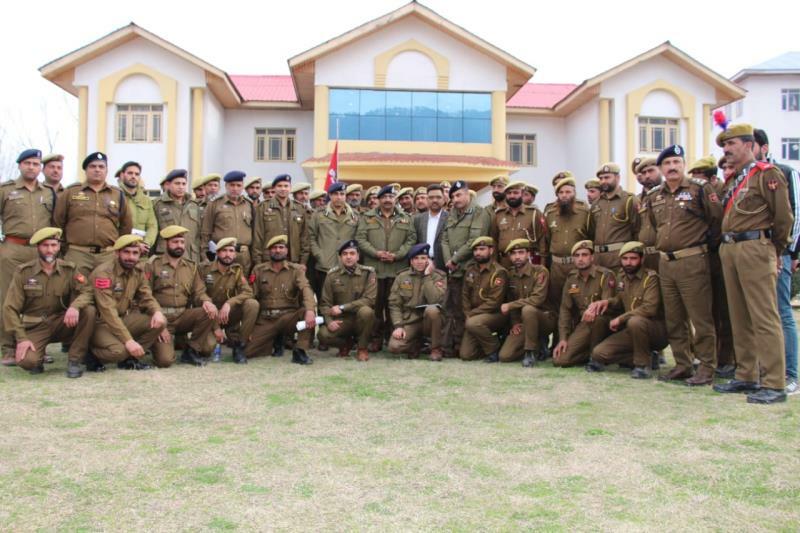 Shri Dilbag Singh, while interacting with the police and other CAPFs personnel deployed in the district, emphasised upon them to remain vigilant and ready for the upcoming Lok Sabha elections. He said that with the announcement of schedule for the elections, responsibilities of all forces have increased and we have to focus on the security measures besides maintaining law and order. DGP said that J&K police alongwith other forces put in efficient efforts to conduct the Local Bodies and Panchayat elections in the state smoothly and now we have to remain extra vigilant and prepared for the Lok Sabha elections. Emphasising for better police public relations DGP said that people’s cooperation is pivotal for the force to achieve more success on anti-militancy front. He said that all the forces have to work together against the terrorism so that peace prevails in the State and Bandipora also becomes terrorist free district. He said that we have to take stern action against the criminals and bring the crime rate to lower ebb. He said that criminals and violators of law should be fearful of law, police and all law abiding citizens must be respected. Appreciating the contribution of SPOs, DGP said that the department is continuously working on the welfare of its personnel and has taken various welfare measures. More incentives benefiting Police personnel and SPOs would be taken up with the Government. He assured that more welfare measures will be taken in future. DGP said that the ‘promotion drive’ which has been started, will continue and in the coming days we will complete the process of promoting more and more officers and other personnel. Giving emphasis on training the DGP said that thrust is being given on ‘training of trainers’ so that we can build capacity and capability of a maximum number of personnel in minimum time. IGP Kashmir Shri S.P Pani spoke on the occasion and highlighted the importance of training for good policing. He also informed the cops about the various welfare measures and incentives being provided by the department. SSP Bandipora Shri Rahul Malik welcomed the DGP and briefed about the working of Bandipora Police. The DGP after interaction had working lunch with the Jawans. Besides the jurisdictional officers of the district, Deputy Commissioner Bandipora Shri Shahbaz Mirza, Commandants and Assistant Commandants of CRPF, BSF & ITBP were present during the interaction. DIG BSF and commandant BSF also interacted with the DGP during the visit and briefed him about BSF deployment and responsibilities.